The new ATLAS result is based on data collected by ATLAS during 2015–2017 at a collision energy of 13 TeV. It provides evidence of “tri-boson” events with a significance of 4 standard deviations. This indication is but the latest chapter in a decades-long history of measurements with weak bosons. The W and the Z bosons were discovered in 1983 at CERN’s proton-antiproton collider. In 1996, at CERN’s Large Electron-Positron (LEP) collider, events with two W bosons were first observed, and shortly thereafter ZZ events were found. A decade after that, WW, WZ and ZZ events were observed at Fermilab’s Tevatron collider. Large rates of diboson events are now produced at the LHC, allowing for precise measurements. Tri-boson production are rare processes predicted by the Standard Model of particle physics. Their production involves self-interaction among the weak bosons, so-called triple and quartic gauge boson couplings, which are sensitive to possible contributions from yet unknown particles or forces. 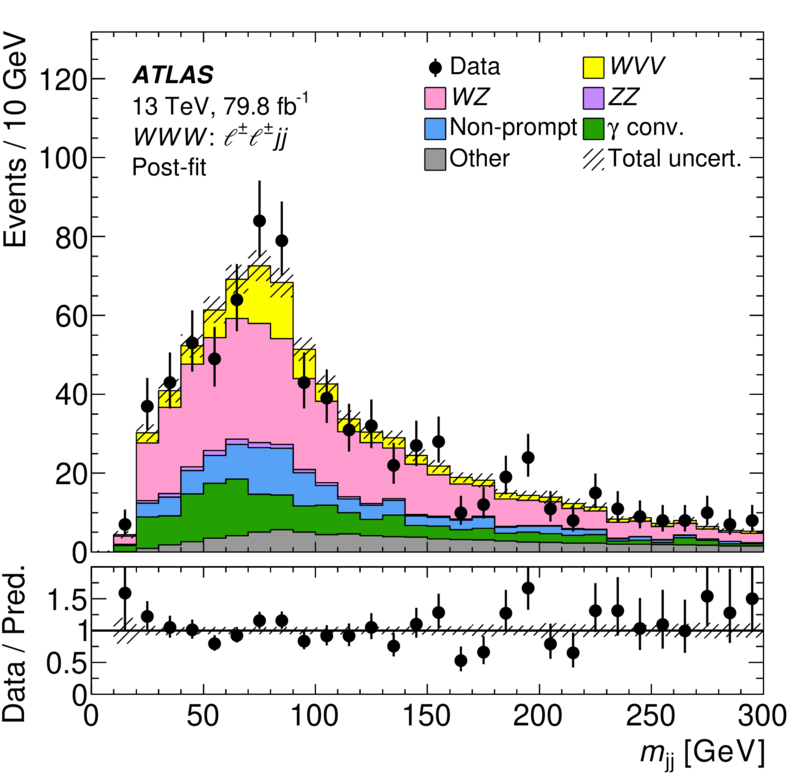 The new ATLAS evidence of tri-boson production is but the latest chapter in a decades-long history of measurements with weak bosons. Since weak bosons are unstable, they are reconstructed in the detector via their decays to pairs of leptons (including invisible neutrinos) or quarks – the latter forming sprays of particles, called "jets". 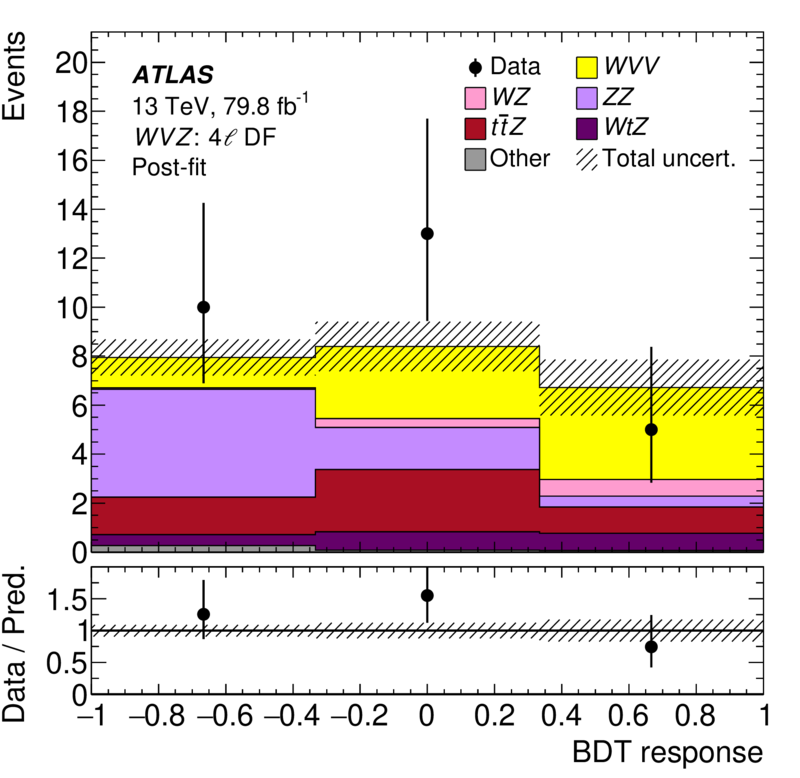 ATLAS physicists combined searches for different decay modes and different types of tri-boson production, including events with three W bosons (“WWW”), and events with one W boson, one Z boson and a third boson of either variety. The latter are known as “WVZ” events, where the “V” is a shorthand for “W or Z”.